"I want to downsize/reduce/be minimalist...but I live with a packrat!" As a "step 1", it can be helpful for you (and your clutterbug) to understand why they clutter in the first place. Why do they hoard, collect, or otherwise find it difficult to "let go" and purge. Jim's guest post on Minimalist Monday also discussed his own personal challenges and emotions he faced when trying to get rid of his own stuff. His brutal honesty is very helpful in understanding why someone might be a clutterbug (and how they can overcome some of their feelings). No matter how cute and persuasive you are, you can't "talk" them out of it or change their mind. This is probably the most important truth you need to accept. There is no reasoning with a packrat, at least not with your words. However, you can SHOW them the benefits which leads to them being persuaded (on their own terms). If you've followed my blog for a while, you know I'm a huge fan of "leading by example" and I think this absolutely applies with minimalism. After all, you can see how my minimalist life rubbed off on my best friend Jim, above. Or how this column inspired others to minimize their life (Jacqueline (and kids), Jen, Marie, and Cathy, just to name a few). Point is, sometimes people have to see to believe. Using Jim as an example again, for years I talked to him about reducing and minimizing, but then when he came to my minimalist habitat, and felt super zen, he finally became inspired to have that in his home. Now that he'd experienced it, he was a believer. Similarly, a friend of mine was going out of her mind living with her packrat husband. She couldn't open any of their closets without things spilling out at her. After a bag of clothes fell on her head (literally! ), she threatened divorce. Of course she was reacting in haste, she didn't really intend to get divorced, but she had had it. Yet her husband, meanwhile, was clinging tight to the bag that fell on her head saying he'd divorce her if she threw his clothes away. He didn't mean that either, but emotions were at a 13 on a scale of 1-10. It felt hopeless. My friend was in tears wondering if she'd ever live in a home that she could stand. "I just can't keep living like this... and it's only going to get worse. I love my husband and I feel bad complaining because otherwise, I know how good I've got it — he's a wonderful husband and father, but I can't keep living like this!" "My husband grew up with nothing, which is why I think it hurts him so much to get rid of anything. It's all a prized possession to him." The clincher was that my friend was also pregnant. It was still early in her pregnancy, but she knew she needed to make room for the baby. Their spare bedroom was filled with her husband's possessions. Their bedroom was also overflowing and crowded, leaving no space for even the tiniest bassinet. To her husband's credit, he was fairly organized and kept everything in Rubbermaid storage containers, boxes and trash bags, but he still had a lot of stuff in a tiny apartment — with a bebe on the way! My friend was hopeful that the baby would change his cluttered ways. That he would part with some of his stuff to make room for their new son or daughter. She'd try to justify taking a box or bag out of the bedroom saying, "we need to make room for the baby" or "trying to make space for the crib." But before she could get out the door, her husband would grab the box out of her hands and put it in the dining room, noting they never really ate in that room anyway. That's when I suggested that she move some of the bags and boxes from the closets (less noticeable when gone) into a storage unit. (And to, perhaps, move it out when he's at work or out with his friends. wink). 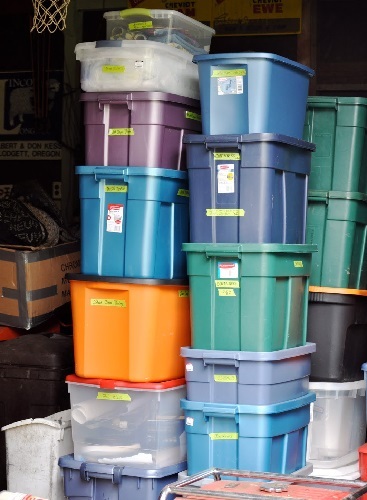 Little by little, she moved things out of their closets and into a nearby storage facility. Her husband didn't seem to notice until the closets really started getting empty — about 3 months later. "Where is all my stuff?" he asked angrily. "I put it in a storage unit, dear. Need me to go get something? Do you need it right now?" He paused, thought for a moment, and said no, and calmed down. His things were safe. Eventually the boxes and bags and containers that filled their baby's room went into the newly emptied closets (some also went to the storage unit, too). Finally, about a year later, when they were doing their taxes, my friend pointed out all the money they were wasting on storage — couldn't that be better spent on their daughter? She was almost afraid to bring it up — worried her husband would want to save money and bring it all back in the house. She had visions of her husband turning their dining room into a storage facility, but something else happened instead: He realized he didn't need those things. He'd lived without them just fine. They could go, and so could the storage unit. He needed to see to believe. Admittedly, I've had my own struggles with Scott. He wasn't a huge collector or packrat, but we had different levels of what was "tolerable." For example, he had several boxes of computer electronics, which I felt was excessive, and he felt... wasn't. I also remember standing in the hallway, Scott trying to pry a bag of clothes out my hand, and me saying, loudly, "you haven't worn these clothes in a year! They're going to the donation center!" But as we started living with less and less stuff, Scott started to see the benefit. He could always find what he was looking for. Our things weren't closing in on us. He too just needed to see it to believe it. (*Scott's totally into minimalism now and has started creating his own "live with less" techy projects like having all of our photos scanned and all of our CDs stored on a hard drive so we can get rid of the physical CDs that took up prime real estate in the closet). 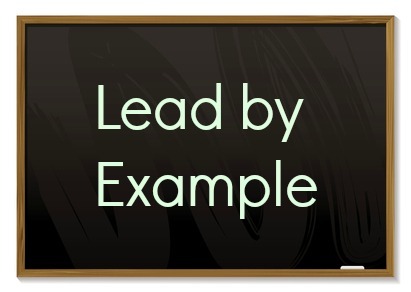 Lead by example. Be an inspiration. Find your work around. Before we could afford to rent office space for Happy Herbivore, Scott's "office" was in our bedroom and my "office" was in our living room. We agreed that the living room (and the kitchen) were "mine" while the bedroom was "his." Point is, we respected each other's space. I bit my tongue about his desk and tried not to clean it up. I stepped around all the papers on the floor in piles, and he didn't mess or clutter the living room. A compromise is still a compromise, but at least I had a zen area of the apartment, and that's where I spent most of my time.